Among the Primatist G series, the 41 is the wildest ensamble of thechnology, research and performance. Bruno Abbate, owner of the yard and winner of several off-shore championships (a man with speed "built-in") says: "It is a boat to ride my way: There are many different way to steer, and they are all understandable, but the feel one gets from managing a 1500 horse-power boat is unexplainable". The G 41, reflecting this philosophy, is a boat for strong emotions fans. Performances and comfort are well balanced together, to offer both pure speed or, if required, relaxing times. The particular personal and aggressive design, is one of the boat's characteristics. Reflecting perfectly its performance, only at sea the boat can display its real potential, discharging its power on a deep V hull. Wave impact is soft and progressive, ensuring safe navigation at high speeds, in rough sea as well. Power transmission is performed by the "Special Tunnel Transmission", a surface-drive propulsion sytem, designed by Bruno Abbate taking advantage from his off-shore racing experience. The tested boat was equipped with twin BPM petrol engine, delivering 750 Hp each, but a wide range of engine options is available. The G41 is capable of a cruise speed of 50 knots at 3800 rpm, while the amazing top speed of 72 knots is achieved at 4880 rpm. The hull and deck lamination is carried out by highly qualified employees, using fiberglass and Kevlar to reduce weight and improve both strenght and torsional rigidity, according to the most advanced construction techniques. The deck and cockpit lay-out are designed to satisfy performance as well as comfort requirements: right aft of the pilot and co-pilot seats there is a practical 4 persons dinette followed by a comfortable sun-lounger, just above the engine room. The swimming platform is fitted with a practical ladder, and serve the purpose of protecting the surface drive as well. The pilot and co-pilot seats design is remarkable: they allow for a comfortable cruise while ensuring a safe steering in stand-up position. They are soft and have a strong structure, well fastened to the deck ensuring the proper support. The co-pilot has in front of its position a practical handrail, which is wery useful. The dashboard is a design masterpiece: practical and elegant, it display all the instruments in a white pannel, which are very well visible in all conditions, ensuring always clear readings. The throttles, as well, has their proper position between the two steering seats, allowing for a quick handling: it is just what you need when the boat jumps out of the water, and you must avoid unpleasant high rpm. Below deck the lay-out follow the sporty boat concept. The living area feature a "U" shaped dinette with a rectangular table to the port side, convertible into a double bed. On the starboard side there is the sofa, while, further to the bow, the double bed cabin feature a convenient skylight providing ample light and ventilation. The separated bathroom, located to the starboard side right after the cabin's access sliding door, includes the wc, sink and shower. 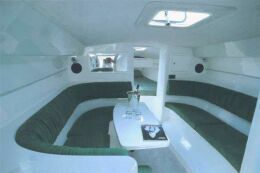 The galley area, with sink and refrigerator is to the port side, and can be fitted with a stove unit on request. Average miles range, at a given rpm, is obtained dividing the total fuel capacity (1000 liters) for the "liters/mile" corresponding to the entered rpm. Plotted fuel consumption is declared by the engines' manufacturer: tuning of the engines, weight of persons, stores, etc... on board, hull conditions and propeller type can effect the real fuel consumption. Hull type: three points deep V planning hull. Construction material: fiberglass and Kevlar - epoxy resin. Fore deck: hatch, two Bruno Abbate designed cleats, hidden windlass and anchor, towing bracket, stainless steel bow protection plate, fore peak and chain locker, navigation lights. Cockpit particulars: two high-performance seats, transverse 4 persons sette, large sun-lounge above the engine room. Swimming platform particulars: teak and stainless steel ladder. Steering station: on the starboard side, with sporty leader wheel, engine monitoring instruments and gauges, compass, rudder angle indicator, multi-function GPS. Lay-out and main features: bow V shaped berth with underneath storage, wardrobe and lockers, lights and skylight porthole; U shaped dinette with rectangular table (convertible into a double bed); starboard side settee with underneath storage and lockers, stereo system, skylight porthole. Galley: to the port side with sink and refrigerator, stove unit on request. Navigation area: on the dinettès table. Bathrooms: separated on the starboard side, including marine toilet, shower with teak grid, sink, accessories, lockers and mirror. Standard equipment: stainless steel ladder, cockpit tarpaulin, refrigerator, compass, 2 hatches, marine toilet, stainless steel handrails, external automatic shower, LOG, rudder angle indicator, battery charger. Optional: safety equipment for off-shore navigation, GPS, multi-function GPS, antifolding, cradle, sun tarpaulin, searchlight, stereo system, VHF, electric windlass, boat canvas, trim tabs, stainless steel propellers, high performance exhaust system, Alcantara interiors, Texilar hull lamination, Kevlar hull lamination, Rina certification, registration. Interiors: in spite of the sporty boat's concept, interiors are comfortable enough for a medium range cruise, the Alcantara fabbric lining emphasize the yard's prestigious reputation. According to the builder's habit, space is never lost and headroom excellent. Passengers comfort: excellent in all conditions, improved by several grabrails. Sound insulation is well studied, even if engine noise is, as usual for high performance machines, part of the boat's charm. Steering comfort: placed to the starboard side, the steering station features ergonomic seats and comfortable footrest; throttles and steering well are well positioned and instruments are well visible. Chart table: on the dinettès table. Galley: as usual on this type of boats, it is just suitable for washing some glasses. It is placed to the port side. Bathrooms: well fitted, illuminated and ventilated. Electrical plant: well placed and convenient for ordinary maintenance, it is made of quality parts. the fuel tank capacity and the underwater exhaust system, while ensuring an higher speed, are not following modern yachting concepts.